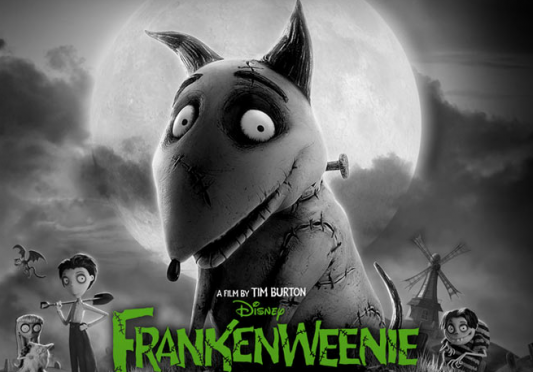 Providing an update to the infinitely flexible Frankenstein tale, Tim Burton’s stop-motion black and white animation Frankenweenie 3D (2012) tells the ultimately heart-warming tale of its teenage protagonist, Victor Frankenstein’s, successful attempt to bring his recently run-over dog back to life. The opening of the film takes us into the Frankenstein suburban household where Victor is demonstrating his latest amateur monster movie to his parents. Of interest to stereoscopic enthusiasts, Victor’s film has been made in 3D, meaning that the images of it that we see are equivalent to those seen by his family. While technological nit-pickers may wonder how Victor’s 3D could function – a Super 8 dual filming process that use two projectors to direct images onto a non-silver screen to be viewed through an undefined type of glasses – Burton himself has glossed over this aspect and, like much of this gothic animation, the details are best left suspended in disbelief. Instead, the nod to stereoscopic filmmaking in this scene points in a couple of other directions. On the one hand it suggests, in the same way that Hugo (2011) did, that cinema is grounded in the magic and illusion of bringing inanimate matter to life. This takes place in both Victor’s amateur movie and the Frankenstein-style electrification of his dead dog. There is a particularly intense fusion of the cinematic illusion of life and the animating potential of science when Victor and his classmate, Edgar, bring another animal, a dead fish, back to life. What was previously an inert object in Edgar’s hands appears to move again while at the same time, stereoscopic effects mean it darts around the screen space as if it were in the auditorium with the audience. On the other hand, Victor’s nascent attempt to get his stereoscopic technology working reference earlier problems that Burton faced with 3D cinema. Although Burton’s The Nightmare Before Christmas (1993) had been re-released in the digital 3D format since 2006, his other major 3D endeavour, Alice in Wonderland (2010) was derided by various critics for using an ineffective 3D post-production conversion process. When Victor’s movie abruptly stops mid-projection because of a problem with one of the film reels, Victor’s distraught apologies and his parents’ benevolent understanding can be interpreted as Burton’s own plea for patience and acceptance as he forges ahead with a technology that has drawn fervent condemnation from critics ranging from Roger Ebert to Mark Kermode. 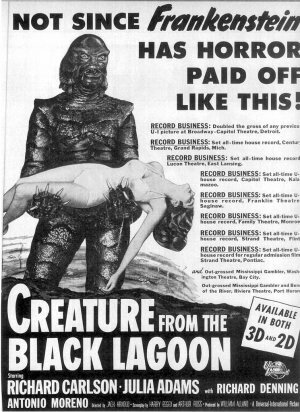 Another possible avenue is, as Mark Kermode suggests, that the use of 3D in Frankenweenie references the 1950s heyday of stereoscopic film when monster movies such as Creature from the Black Lagoon (1954) provided inspiration for Burton’s filmmaking (although Kermode does erroneously suggest the difference is that the 1950s films were in the anaglyph format). Although the opening scene invites a reflection on the technological apparatus at work in 3D cinema, it also raises the question of what happens when you watch the film in 2D (the version also available in many cinemas). The obvious point is that you don’t see Victor’s movie as he and his family see it but it also draws attention to the other aesthetic elements that are missed in the 2D version. Chiefly, the round, curved forms that are predominant in much of this type of stop-motion animation and enhanced by the stereoscopy, stand out less when seen in the ‘flat’ format. 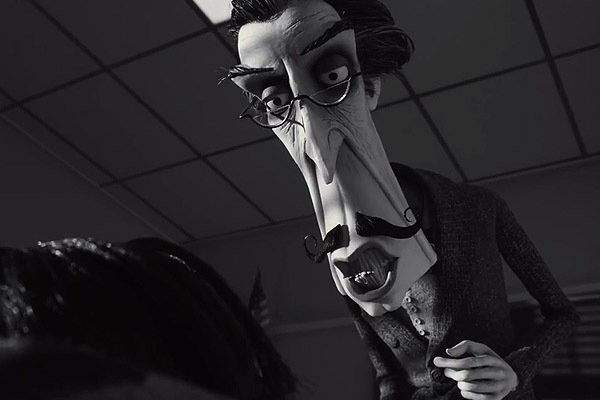 The gothic nature of Frankenweenie’s world gives many characters dark, hollowed eye sockets sunk behind rounded, bulging faces and these depth extremes are particularly noticeable when viewed stereoscopically. Consequently, the individual traits of the characters such as science teacher Mr Rzykruski’s pointy nose and other spikey features or Mayor Burgermeister rotund belly are highlighted when they seem to come into the auditorium in negative parallax or recede away in positive parallax. What is distinct in this film from other digital 3D films is the use of black and white. The black and white schema clearly fits with the muted colours used in other works by Burton such as Corpse Bride (2005) and fits with the gothic nature of the Frankenstein theme. Although earlier twentieth century 3D cinema was commonly filmed in black and white, the recent wave of digital 3D has accustomed us to watching stereoscopy in colour, meaning that the use of black and white now stands out. It was a factor that niggled at me when watching Frankenweenie. Throughout much of the film negative parallax was used effectively to bridge the space between the film’s content and the audience. Hedges and other shrubbery seemed to pop in front of the screen’s frame and characters’ faces loomed out towards us. However, I didn’t feel the same visceral connection to the film’s material substance that I had felt in other recent films. 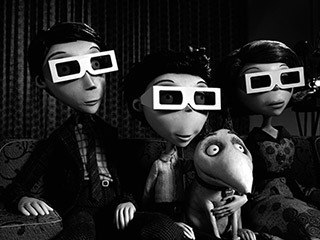 Clyde DeSouza notes a number of flaws in Frankenweenie’s 3D processes and these may have had something to do with it but I think it is more likely that the black and white format halted the visceral connection. Feeding into this was a couple of aspects. Firstly, the images were incredibly crisp. While this factor helped the stereoscopic definition and gave a clear sense of depth, it didn’t seem to fit with the quirky and murky nature of its fictional world where boundaries between the monstrous and the normal and the nightmarish and the ordinary where transgressed and melted together. Secondly, there seemed to be an aesthetic inconsistency in Frankenweenie’s suburban set-up. The house, streets and school were clean and fresh and, to a greater extent, so was the Frankenstein household (although Victor and his parents did have the shadowy eye sockets the rest of the characters had). It was the other characters that had the tics, quirks and monstrous qualities. If this contrast has been worked into the story (as it has been in Edward Scissorhands (1990) it might have made sense but my feeling was that the gothic was only apparent in the secondary characters and it was unclear how they fitted into what was an otherwise perfectly clean and crisp world. These aspects seemed to be enhanced by the black and white and while, overall, it made for an interesting aesthetic experience it was never completely compelling. 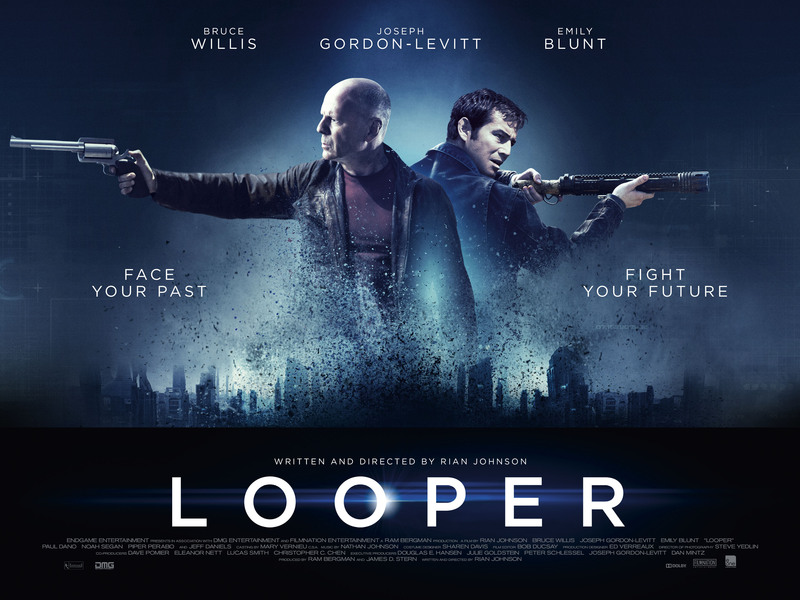 When Looper (2012) entered the movie theatres in late September there was much hype across the usual internet sources such as Twitter, Facebook and blog sites. Currently it stands at over 90% on the Rotten Tomatoes breakdown of favourable film reviews and many hyperbolic statements have been made suggesting it is not only the smartest movie ever seen but also a signal of Hollywood’s new ‘intelligent’ era. Based on the concept of an apocalyptic 2044 where assassins (Loopers) are hired to kill individuals sent back in time from 2074, the film treads slight ground between the realm of possibility needed to engage audiences and the fantastical nature of the time-travel narratives. Critics were quick to point out that the film should not be judged by picking apart holes in the narrative, particularly as a wry moments between the protagonists Joe (Joseph Gordon-Levitt) and Old Joe (Bruce Willis) states that the complications of time-travel are not worth spending much time on. My own feelings were that the script was sufficiently well constructed to ask the audience to suspend their disbelief and that the time-travel conundrum was dealt with in a satisfactory manner. (For an alternative opinion see here.) What did set me aside from many of the critics I read, however, was a huge sense of disappointment in the way the script was brought to production. In particular, all the audio-visual elements that make cinema a unique art form seems to be co-opted in order to produce a conservative and regressive film that didn’t do justice to the wealth of cinema culture that Looper had at its disposal. While there were many things that frustrated me in the film the following is a list of seven things that, a couple of weeks after watching Looper, still bug me. 1. The film makes clear its debt to twentieth century film, particularly techno-noirs such as Blade Runner (1982), Terminator (1984) Gattaca (1997) and RoboCop (1987). For cinephiles this is a welcome salute to films that were at times ground-breaking and more often than not able to catch a mood in the twentieth century that wasn’t expressed elsewhere. Why, then, does Looper also play homage to films like Showgirls (1995) and Striptease (1996) with a female character, Suzie (Piper Perabo), that has her clothes off for 80% of her screen time? 2. Following on from this point, the link to Terminator is particularly clear when Looper’s Sara, like Terminator’s Sarah, is portrayed as a mother who will desperately save her young son at all costs. 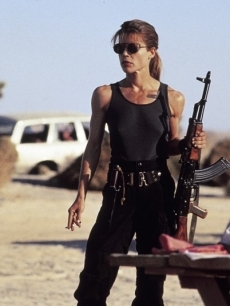 But why does Looper reset Sara as the in-need-of-a-man-to-save-me figure that appeared in the first Terminator rather than the beefed up Sarah Connor that could hold her own in the later Terminator 2 (1991) (a Sarah that at least knew how to point a gun and pull the trigger)? 3. It seems understandable (albeit slightly puerile) that in a twenty-first century society concerned with a ‘crisis in masculinity’ Looper places a strong focus on examining mother-son relationships. Recent films such as We Need to Talk About Kevin (2011) have done this in a complex, exploratory and non-moralising fashion. Why did Looper need the blunt voice-over at the end of the film to emphasise the point that humanity will only be saved when women are allowed to return to their correct place as mothers. 4. Why the clunky editing that on so many occasions was timed to the exact meter of the music, with the effect that individual shots seemed to scream ‘look at me’ rather than allowing the audience to follow the more subtle rhythms of what were, for the most part, good performances? 5. Why did Looper make it clear that the only splurge in the budget went on flash cars and futuristic scooters with the aforementioned editing used to make sure we don’t accidentally miss them? 6. 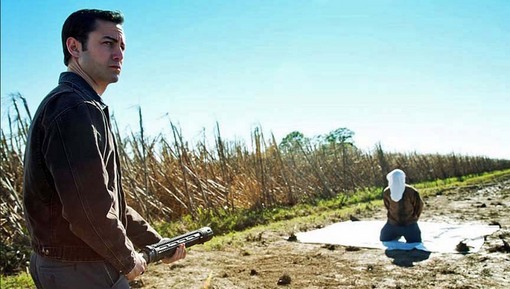 In the same way that Inception (2010) spent much of its time articulating a complex premise with three-dimensional characters, Looper introduced a range of engaging ideas and multifaceted personas to deal with its time-travel complications. Why, then, the formulaic action finale whereby, in a similar manner to Inception, a range of anonymous ‘baddies’ are thrown together in an almost intelligible chaos-cinema scene that results in the meaningless destruction of all involved. 7. Some reviewers have picked up on the potential political allegory presented by the victims that come back in time in face-covering hoods. Why does the film seem to make a claim that it is ideologically unsound to turn humans into faceless others that are unworthy of life when it does just that to its faceless baddies that are slaughtered without consequence in the action finale? 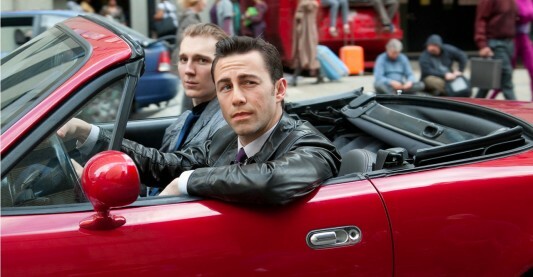 Much of my thoughts on the gender roles in Looper coincide with those articulated by the Feminish blog. In that account other issues, such as the silent Asian female stereotype, are also written about and are worth reading. On an ending note, I think Looper is a film that can be enjoyed for pure entertainment purposes and it works as an interesting (even if not so successfully executed) companion piece to Twelve Monkeys (1995). Just don’t tell me it is the smartest movie you have ever seen. Dredd 3D (2012) has already been praised for good use of 3D effects but will most likely be remembered, visually, for its slo-mo sequences. Set in an apocalyptic future, the film deals with Judge Dredd (Karl Urban) and his sidekick Anderson (Olivia Thirlby) who, on a normal day on the job, come up against Ma-ma (Lena Headly) the drug lord presiding over the manufacture and distribution of a new narcotic called slo-mo. Their city, a post-nuclear zone that stretches across most of the US, has a ravished, post-industrial appearance that is muted by its grey and burnt-out brown tones. Similar in appearance is the Ma-Ma controlled Peach Trees tower block that seems to be a more violent version of Hong Kong’s Chungking Mansions. 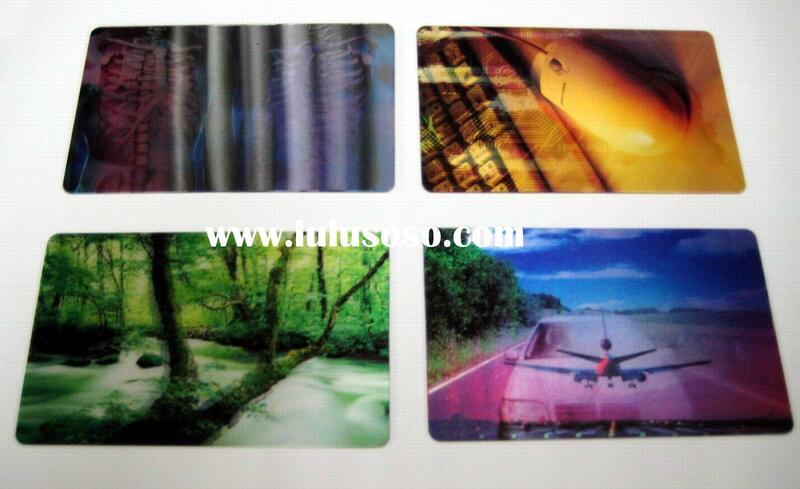 When various users, including Ma-ma, are seen taking the slo-mo drug, the film’s stereoscopic effects are ramped up and the colour palette changes to vivid acid tones which, on the one hand, point to the LSD precursors for the drug and, on the other hand, remind us of the lurid colours frequently used in lenticular images. Bright oranges, greens and blues clash together but are given a fluid and liquid like consistency by the slow motion pace that is set in these sequences. Mark Kermode has already pointed out the danger in setting up a film premised on a drug called slo-mo that for all extents and purposes sounds like the now infamous Chris Morris hoax drug Cake that British politicians took to be a real threat. This problem of whether to take something called slo-mo seriously was further confused by Dredd’s own viral marketing campaign Say No to Slo-MO Public Service Announcement. While the film and marketing campaign seems to be asking audiences to buy into the drug as a believable possibility in an alternative world, its very name seems too close to a self-reflection on one of film’s most illusionistic techniques. As with many films focusing on drug use, there is the secondary problem of how to translate the highly personal and embodied nature of drug taking on to a flat screen at a distance from the audience. Requiem for a Dream (2000), Trainspotting (1996) and, more recently, Looper (2012) have all combined dynamic editing, emotive sound and close-ups on the reaction of the iris to try and display the different effects that narcotics have on the senses. In a slightly different way, Dredd changes the entire mise-en-scene to reflect an entirely different perception of the world brought about by the drug use. While the former films often show a flip-side such as the trip gone wrong or a horrendous come-down – Requiem’s manic Sara Goldfarb, the baby crawling across the ceiling in Trainspotting, – Dredd is interesting for the way in which it retains the gruesome amongst its highs. Ma-ma’s grotesquely scarred face is clear to the viewer as she is enveloped in the liquid colours around her. Blood and body parts hurtle around in slow motion when other characters are killed during the drug scenes. However, what is ultimately more interesting for me is the way Dredd makes use of specific stereoscopic effects to try and breach the no-man’s land between the visceral experience felt by the characters taking drugs and the stationary and inert audience member in the auditorium. The reduction of pace to a slow emotion effect in the scenes allows the depth effects of the film’s stereoscopy to stand out. 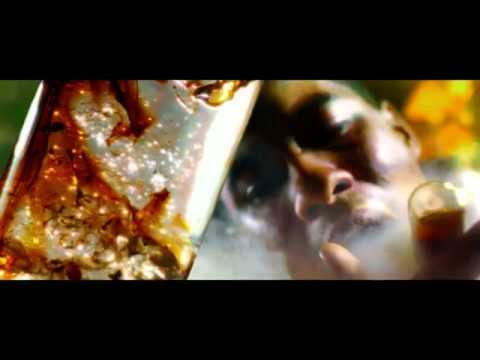 Ma-Ma is first seen visualised through the slo-mo effect, sitting in a bath tub behind a screen of swirling cigarette smoke that moves impossibly slowly. This smoke separates us from her but it is transparent enough to be traversed so that we feel as if we could reach through and touch her. Seconds later, a close-up shows her hand dragging water out of the bathtub. Droplets stream slowly through the air and towards the audience in particularly strong negative parallax. At a later point in the film, Judge Dredd and Anderson interrupt other users experiencing the drug. As they shoot the users, the blood and other body fluids, are not just hurtled around screen but are channelled directly towards the auditorium in a similar slow motion and excessive negative parallax effect. For me, these moments produced the spine-tingling effect that happens when you witness something so visceral that it seems to send shocks through your body. Although I didn’t reach up to try and grasp the elements that came towards, I felt that they were almost upon my skin. While the effects in no way helped me replicated the narcotic experience that the characters were undergoing, they did leave me with a heightened bodily experience that wasn’t available in the other scenes in the film. It becomes obvious in Dredd that overt 3D negative parallax effects are saved specifically for these slo-mo sequences. Although at one point Ma-ma engages in a brutal shoot-out with inhabitant of Peach Trees, the directions of the shooting and the resultant debris is mainly horizontal, across the traditional screen plane, rather than in overt negative parallax. In a similar way, when Dredd has his incendiary moment when he torches many of the characters chasing him, there are a number of spectacular flame effects but little of it seems to burst directly into the audience’s space. The final slo-mo scene, during which Ma-ma falls from the top of the tower block, returns to stereoscopic effects and throws, directly at the audience, the glass shards from the window she shatters. It is the moment at which the body of the film most strongly violates the audience spaces and appears to be able to penetrate our viewing bodies. Significantly, this effect is immediately inverted as Ma-ma hits the ground. The various colours in the shot intensify and merge until they bleach out entirely and the screen becomes an intensely bright, white plane. Its flatness becomes immediately apparent, surrounded as it is by the black border of the frame. This is the end point of the stereoscopic spectacular in the film. The rest of the film is not 2D and there are other points where stereoscopic effects are used. 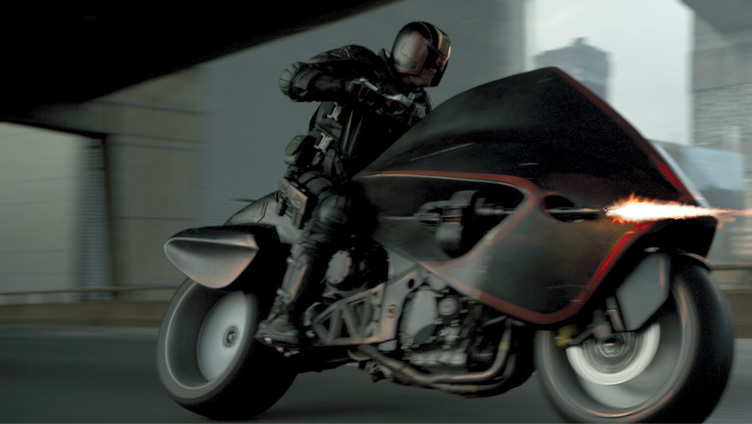 Throughout the beginning of the film there is a lot of stereoscopic ‘bulge’: vehicle parts such as Judge Dredd’s motorcycle and car bonnets swell towards the audience, protruding out beyond the traditional plane of the screen. This happens not just with large objects but also with characters such as the point when a criminal holds a girl hostage down-screen right and their bodies bulge towards the audience. There are also a number of shots that look down the perspective lines of the tall buildings, enhancing a sense of vertigo through use of positive parallax. These overhead shots are particularly predominant when the camera looks down the full height of the Peach Trees’ central shaft, at one point following three characters as they fall from the top to the ground below. Nonetheless, the most memorable and spectacular instances of 3D effects take place in the slo-mo sequences. Like many other narrative films, viewers are going to wonder about the parameters of its fictional world. It is not just that the film involves a brand new drug; there are also Anderson’s psychic abilities. At points it is unclear how far these abilities reach with some obvious moments when the audience will wonder why she didn’t see certain things coming. However, the tight construction of this world, based almost wholly on the Peach Trees tower block and the lack of an expository voice-over, which is so common in these types of films, leaves enough space for audiences to make their own minds up.